Pushpak Ganapati or Pushpaka Ganesh is the name of Khairtabad Ganesh idol for Ganesh Chaturthi 2010. Khiartabad Ganapati vigraham is known as the biggest Ganesh idol in India. For Ganesh Chaturthi 2010, height of Mammoth Ganesha idol will be 50 feet. The theme or the concept of Khairtabad Ganesh 2010 is Vishwa Shanti or world’s peace. This time Ganpati statue appears in Pushpaka Vimanam (Pushpak viman). Five-headed snake will be appeared on the head of Ganesha. On the right side of Ganesh idol Tirumala Tirupati Sri Venkateswhara swamy (Balaji) along with his divine consorts Lakshmi Alivelu Manga are constructed. On the left side of the idol there will be the origin and legend of Sri Renuka Yellamma (Renuka Devi). Rajendran is the sculptor of this Pushpak Ganesh idol. Here is the image of Khairtabad Ganesh 2010 image for Ganesh Festival. 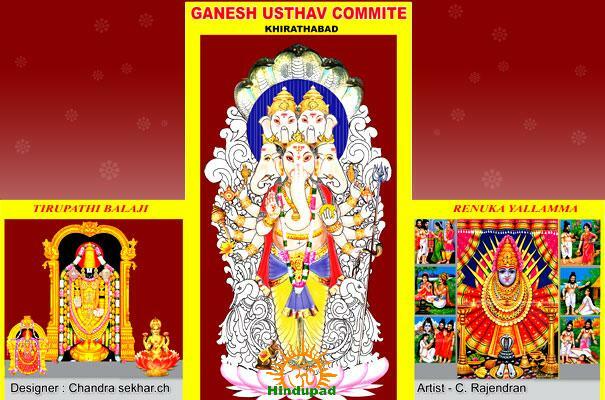 You can also find the official website of Khairathabad Ganesh.